If your child is 10 years old or younger, have them share in the fun of our birthday club today and we will send them a special birthday coupon for a FREE Kid's Birthday meal! So when their big day arrives, come in to your neighborhood Rockne's and we will help you celebrate! Rest assured that Rockne's takes your privacy and your family's privacy seriously. We do not share any information with any 3rd party of any of our Kids Club members. Be a Part of Our Birthday Club! Complete the form below and during the month of your child's birthday, we will send you a special birthday email for a FREE Kid's Birthday meal! When you come in for your Free Kid's Birthday meal, we are going to give a new $2.00 bill to the Aladdin Foundation in your child's name. 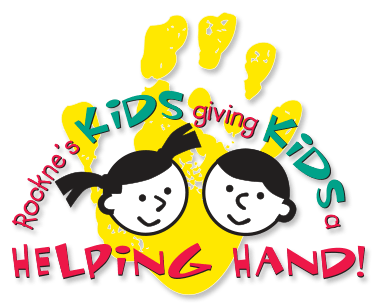 Together we can give kids a hand. The Aladdin Foundation was formed to fulfill the wishes of sick kids. Since it began in 1982, the Foundation has fulfilled over 1,300 requests, giving more that $2 million to date. 100% of the money raised is used for the kids.